For those readers who read the post I published yesterday, I want to offer my sincere apologies, but also thank those who had something kind to say about a job only half way completed. I did what every writer must have nightmares about: I mistakenly hit the publish button before my post was finished or edited. This is the finished rendition complete with a picture gallery, I hope. After more than two months in the busy cities of Chiang Mai and Phnom Penh, I was ready to escape to the sleepy, laid back town of Kampot in southern Cambodia. I fell in love with this charming, French colonial town last year so was compelled to come back again. I stayed in the perfect place for me: a guesthouse called Mea Culpa about a ten minute walk from the centre of the town in a quiet garden setting. You can take a closer look by following this link: meaculpakampott.com. Om House for a tasty fish amok, one of Cambodia’s signature dishes. Everything is prepared using fresh, organic ingredients. the Espresso Cafe for the most delicious coffee roasted on the premises and the banana pancakes with a caramel and sea salt syrup to die for. the Kampot Pie and Ice Cream Palace for a breakfast of Mary’s Bird Nest (egg embedded in a large piece of toast and topped with cheese) accompanied by an excellent cup of coffee. the Kampot Kooker and the Honeymoon Creperie both located on what is commonly known as “Eat Street” and both good for tasty and inexpensive dinners. the Greenhouse about five kilometers up the Kampot River in a beautiful setting with the restaurant and patio looking right over the river. I had their French breakfast of juice, coffee, and croissants which was delicious. It was well worth the long bike ride up there! If you wish to read more about this little haven and how it originated then go to greenhousekampot.com. and finally, I ate at Mea Culpa which has its own restaurant serving food all day if you haven’t got the energy to walk to town. They are famous for their wood-fired pizzas which I do recommend and their appetizers which are almost big enough for a meal. By mid-week I was ready to explore some of the outlying areas of the town so signed up for tour of the countryside which took me to visit the salt flats where salt is harvested from the sea, a local pepper plantation where the famous Kampot pepper is grown, a Muslim fishing village, a temple cave, the Secret Lake which isn’t so secret where no one seems to know how it got its name, a trip to the nearby town of Kep for lunch at the Crab Market, and finally, a visit to the beach. We were a group of four and none of us was prepared for the crowd we met at the beach. Since it was the Chinese New Year, families from as far away as Phnom Penh had come for a swim and to picnic. Towards the end of my stay, I decided to pamper myself with a massage at the Banteay Srey Woman’s Spa. 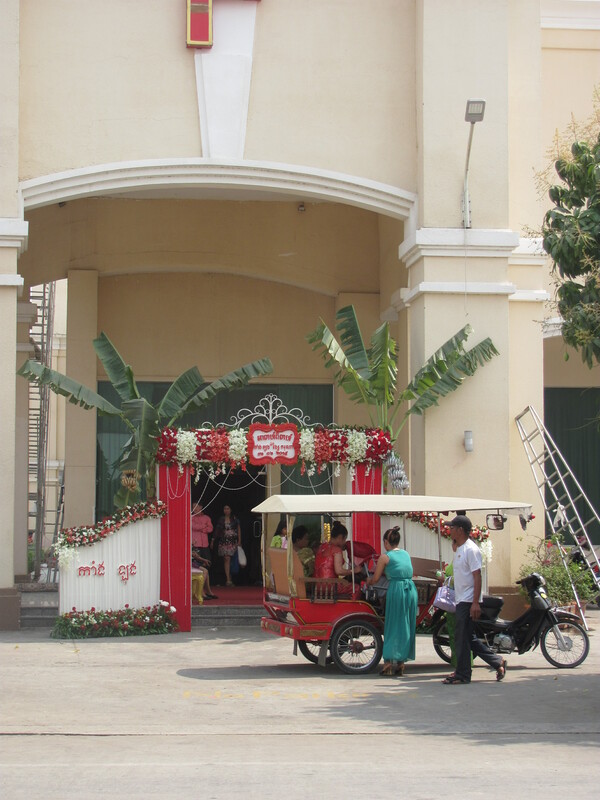 This spa was started by a Canadian woman from British Columbia as a project to give poor Cambodian girls the training necessary to get them off the streets of Phnom Penh into an honorable profession where they can now proudly display their skill at administering healing massages and cleanses and surprisingly creative henna body art. I had one of the best massages ever, consisting of a total body scrub with milk and turmeric followed by a steam bath of fragrant herbs. When finished my skin was a soft as a baby’s and I felt wonderful – at least 20 years younger! Although some travellers might find Kampot just a little too laid back, the majority of Cambodians as well as the French colonials who helped build it used it as a place to chill out and to escape the heat and chaos of the city. Those who come here to visit or stay prove this is still true today. For instance, many of the restaurants, resorts and guesthouses are owned and run by ex-pats from Europe, Canada, and the US. They all love the lifestyle and are working hard to maintain it. There are still some of the old French buildings needing repair but many have been restored to their original glory. Not only the architecture but also the scenic riverside boulevard which is unmistakingly French is helping to preserve the charm this town has always been noted for. It is still a great place to escape to and I feel hopeful it will remain so. Om House restaurant in newly restored colonial building. Banana pancakes at Espresso Cafe. A latte at Espresso Cafe-delicious! The Kampot River from the deck of the Greenhouse. Thatched bungalows at the Greenhouse. Woman working in the salt fields. Woman not working in the salt fields! A very old temple cave. This is why this cave is also called the “elephant cave”. The not so Secret Lake. Our little tour group and tuk tuks. At a pepper farm near Kampot. Emptying crab traps at Kep. Cambodian lady selling the blue crab. All kinds of fish for sale at this Kep market. Cambodians celebrating Chinese New Year at Kep Beach. Banteay Srey Women’s spa in Kampot. One of the original French buildings in Kampot. More children who like to have their picture taken. Enjoying the sunset along the river. After a hair-raising but eye opening ride from the Phnom Penh airport to my hotel, I have since been questioning just how this city, the capital and pulse of Cambodia, ever earned the reputation for being SE Asia’s “Pearl of the East”. This was my second visit having been here last year with my husband. Admittedly, I experienced some culture shock on my first day last year which I wrote about in a previous post entitled “Soaking up Phnom Penh”. However, I quickly banished any reservations I had about the disparity between the rich and poor, the heaps of garbage piled on every street corner, and the chaotic traffic when I fell under the spell of the smiling and very hospitable people. Was this year any easier? Surprisingly it was not since the three offenses that assaulted my senses last year had an even greater impact on them this year. The traffic is always the first thing that has to be dealt with if you arrive by plane at the airport as I did. 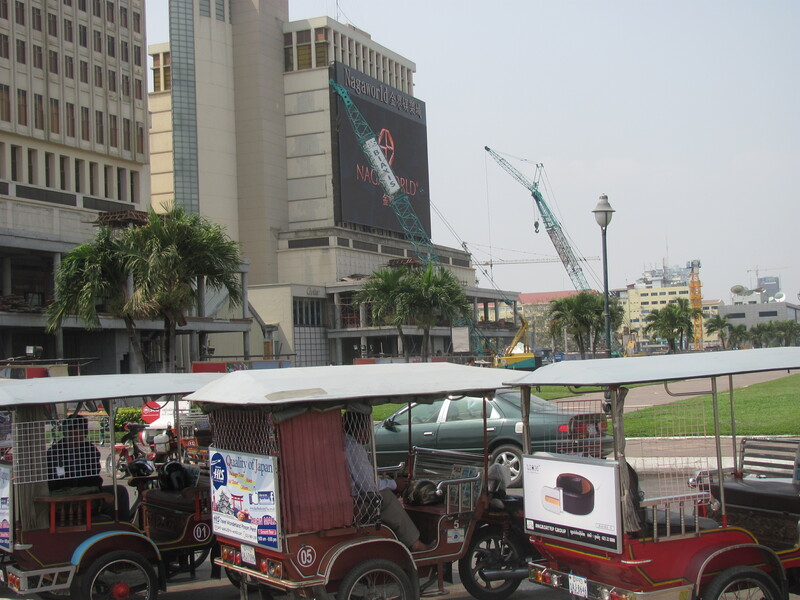 You have the choice of using a taxi or a moto-car or tuk tuk as it’s commonly called. Since I try to travel on a budget, I again chose to hire a tuk tuk driver. Last year I was awed by the dexterity of my driver who managed to weave in and out of the chaotic traffic with such ease. This year was somehow different. Many of the moto- car and motor bike drivers were not so serene and were showing some obvious signs of distress. They were all taking risks that literally took my breath away and caused my driver to actually swear. My mind flashed back to the New Delhi drivers who had to fight for every inch of space to keep moving forward. 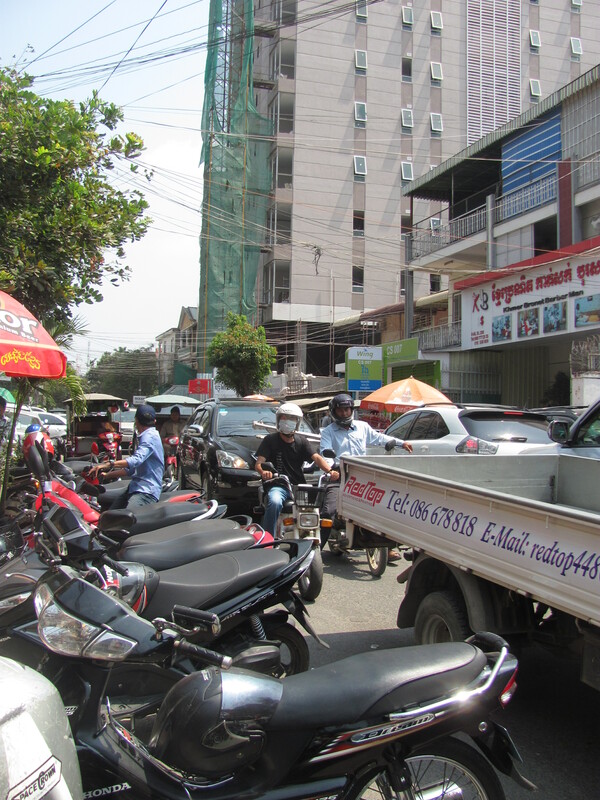 Now I realized this was happening in Phnom Penh. When I looked around me, I was dismayed to see that we were surrounded by monstrous vehicles taking up so much space that they were literally forcing all the other vehicles up onto the sidewalks. To make matters worse some were coming at us going in the wrong direction. I must have witnessed at least a hundred near misses on that ride to my hotel. 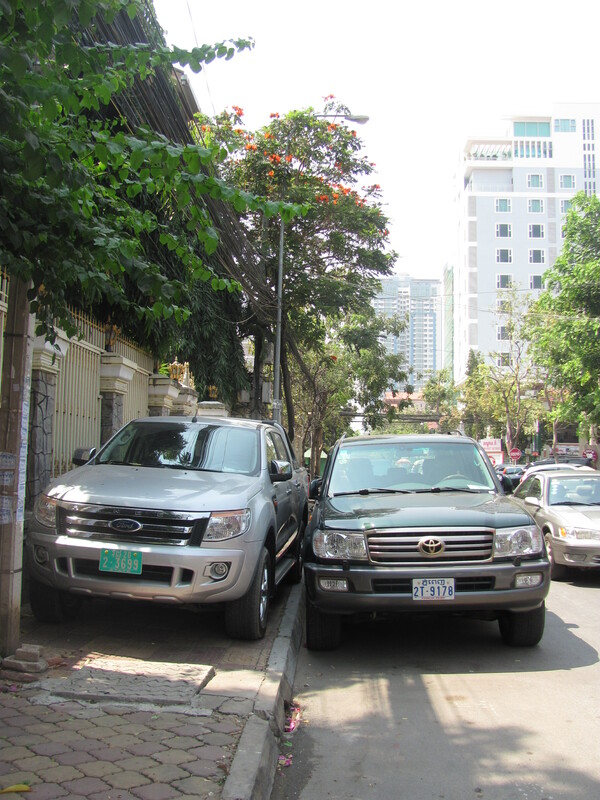 After a few more days of walking the streets, I realized just how these vehicles were making the pedestrians’ lives miserable by taking up their sidewalk space as their parking lot. There was hardly a small car to be seen anywhere! A journalist friend explained why there are now so many. Apparently every year government workers are rewarded with big bonuses and the huge monster vehicle has become the unanimous choice for everyone. Naturally, they bring them to the centre of the city for business and pleasure to show off and gloat in the fact they never have to walk anywhere. I had to laugh after reading a brochure published by the city’s tourism department claiming that it was a wonderful city for ‘leisurely strolls’! Like many tourists I love to walk around a city to get a proper feel for it and to take photos which are often the impetus for my blog posts. 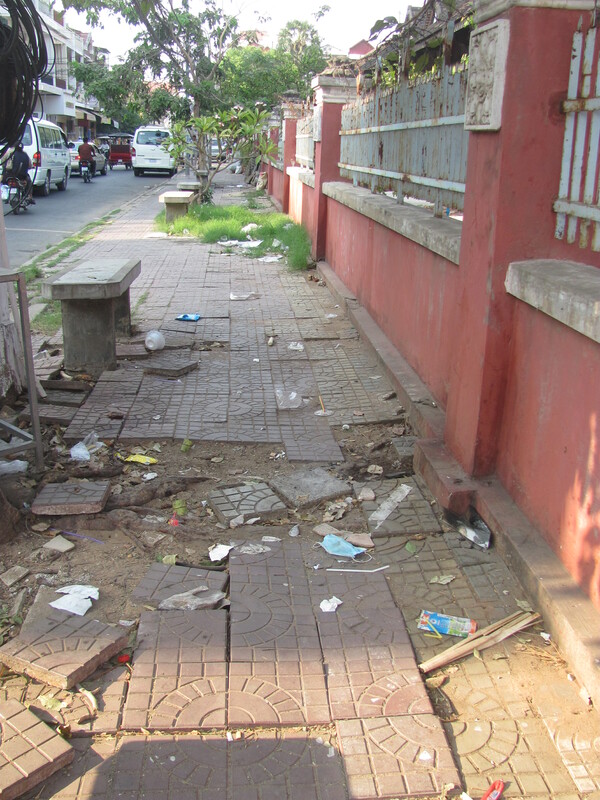 I would guess that it is now one of SE Asia’s worst cities for walking. Not only are pedestrians having to contend with the traffic, but also the seemingly endless construction, destruction, and reconstruction projects going on at this time. The sidewalks are littered with piles of earth, bricks, building materials, and whatever else it takes to build yet another huge hotel, luxury condo, or office tower adding another challenge to any kind of safe walking. 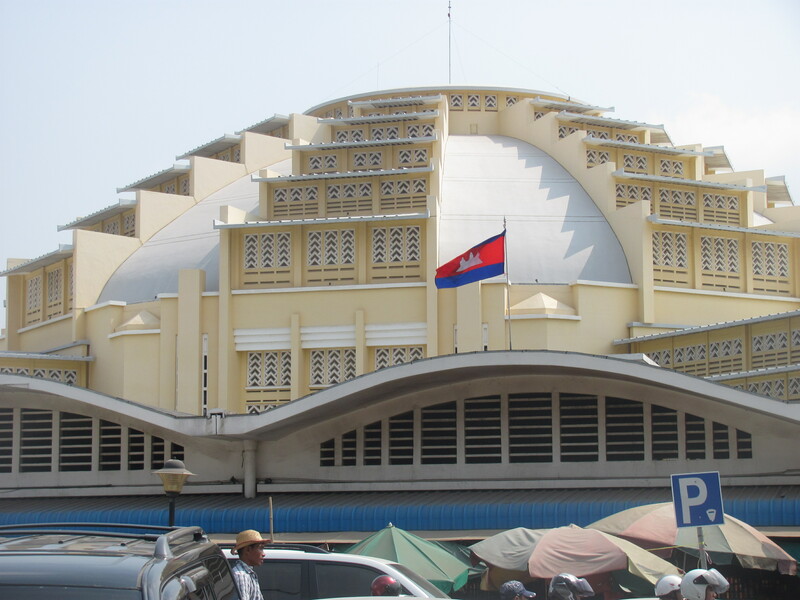 The People’s Party of Cambodia is committed to reviving this city’s former status as the “Pearl of the East” at any cost by allowing such extreme over development. One of many sidewalk hazards. Another luxury condo under construction. The Naga Casino under construction with moto-bikes (tuk tuks) in foreground. 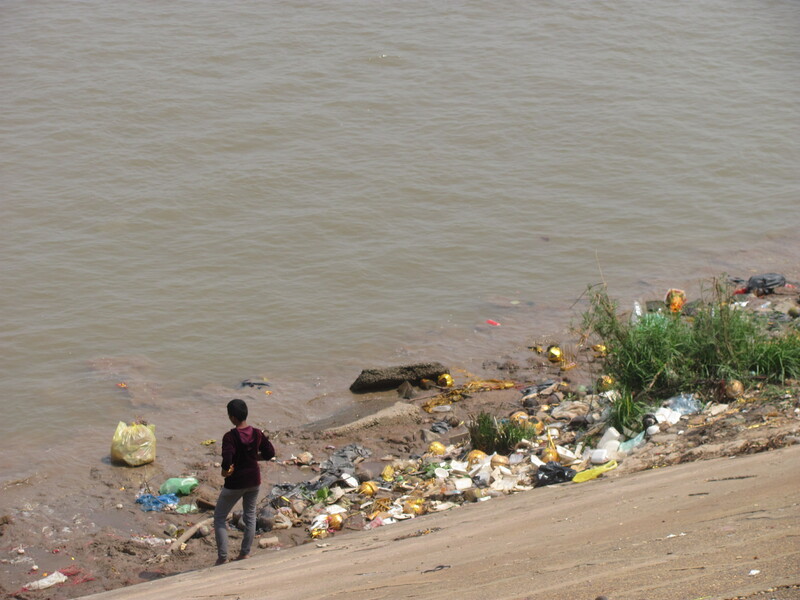 Along the Tonle Sap River. I remember last year on my first day here, I was appalled by the stark difference between the rich and the poor. There was little evidence of any kind of middle class. The divide is still very much in evidence. 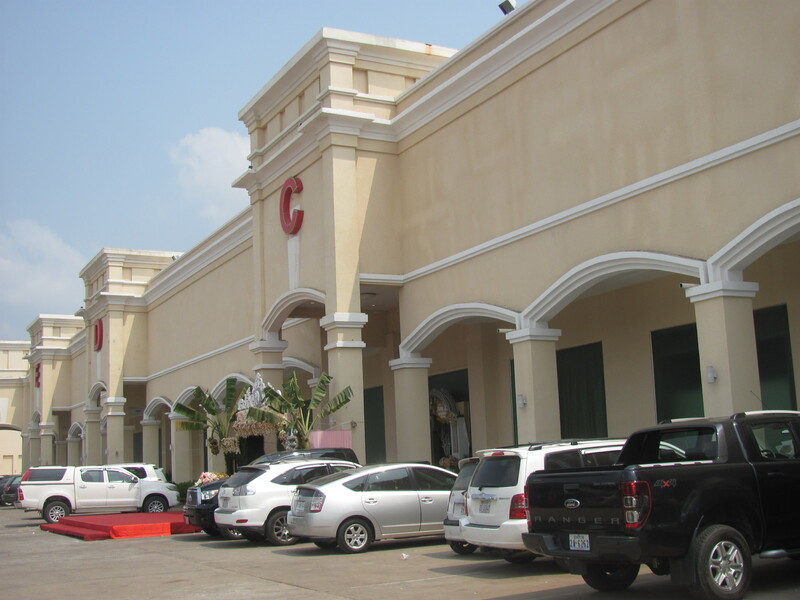 The rich, who are mostly Cambodians who work for the government and some of the NGO’s who work here, are driving all those big cars, living in the opulent mansions, and eating in the upscale restaurants. The poor are having to live on the streets or in inadequate buildings where their rents are increased every time they get a meager increase in wages. They are by no means doing any better and from what I have seen or heard are doing worse. 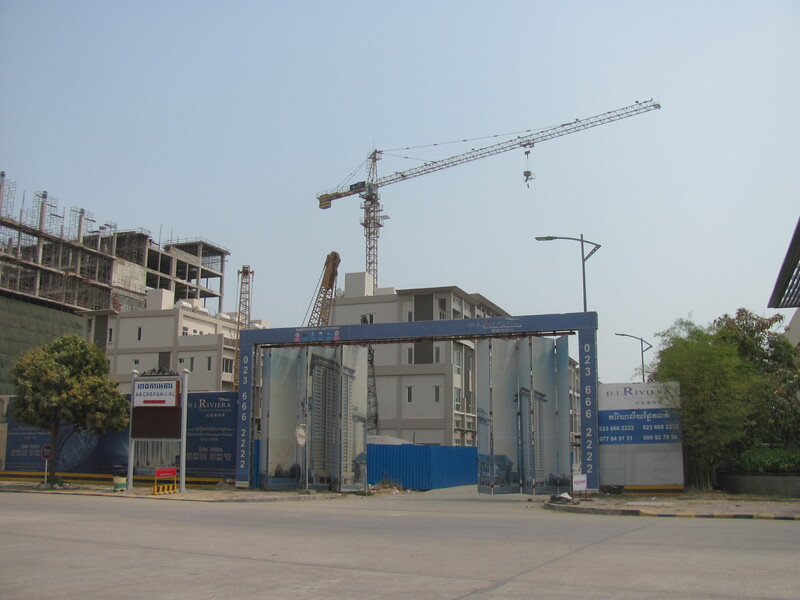 Land in the city which has now become valuable real estate is being bought up at ridiculously low prices by the developers. This results in a huge problem for those former land owners as they cannot afford anything in the city so hence could easily end up on the streets. 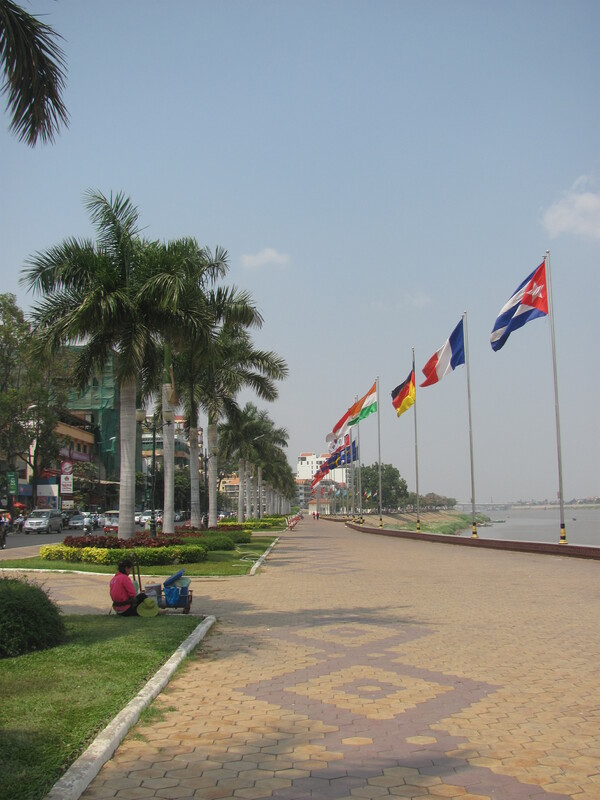 As I walked along the riverfront boulevard or Sisowath Quay, one of the main tourist attractions lined with chic shops, restaurants and bars, I noticed more obviously poor families trying to eke out a living by selling drinks or flowers with what looked like their few family possessions and children surrounding them. 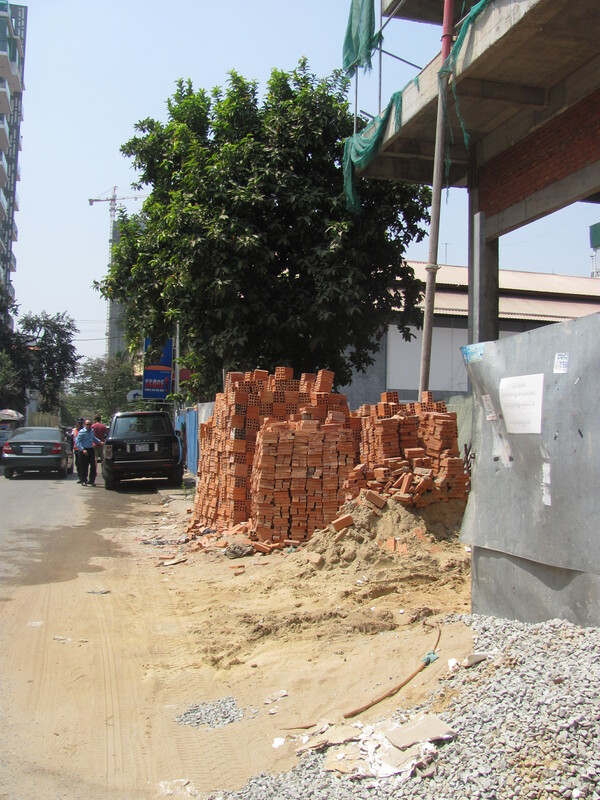 One doesn’t have to look far to see such extreme poverty in Phnom Penh and to have it so close to this touted tourist area and not far from another huge project being build on Diamond Island for those with the money is upsetting to witness. Sisowath Quay along the riverside. Huge hall where lavish weddings are held on Diamond Island. Wedding party after the ceremony. Once you adjust to the social conditions of a good portion of the over 2,000,000 people who live in Phnom Penh, you begin to appreciate what the city has to offer. 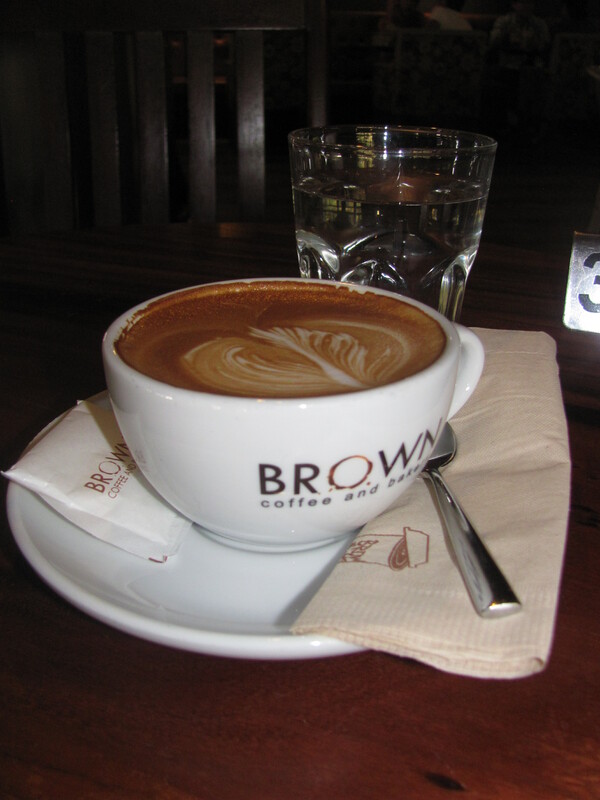 Since I am one of those who thoroughly enjoys their excellent coffee and food, not to mention all the places I have stayed in which are just as good if not better value as in Thailand or elsewhere in this part of the world, I need to give some credit to those countries i.e. Japan, Thailand, Viet Nam, China and some European countries, who have played a significant part in bringing Phnom Penh into a destination to be seriously considered by a growing number of tourists. For a long time the tourists who ventured to Cambodia came to see Ankor Wat in the north and then headed south for Sihanoukville to cool off after clamouring over the ruins of Ankor. 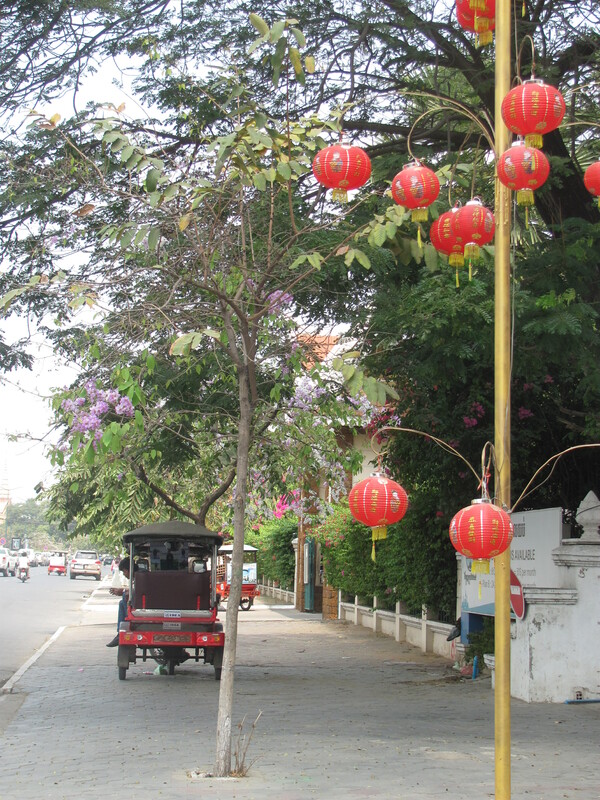 Very few would stop for any length of time in Phnom Penh. It’s truly surprising when you take the time to remember that the city’s infrastructure still lay in ruins and life here was pretty rough as late as the 1990’s after the Viet Nam war and the rise of the Khymer Rouge. For three years at the height of the Rouge tyranny, it lay practically deserted after most of the residents were led astray and herded out of their homes en mass with nothing save the clothes on their backs. Most of them were executed never to return. A memorial to this horrific event has been erected in the Killing Fields where the bodies were buried. This site, as well as a former school which became infamous as the Toul Sleng Genocide Museum where people were held until executed, have become popular tourist sites for visitors who want to learn more about the madness that overran this country in the ’60’s and ’70’s. My favourite drink from a popular cafe near my hotel. 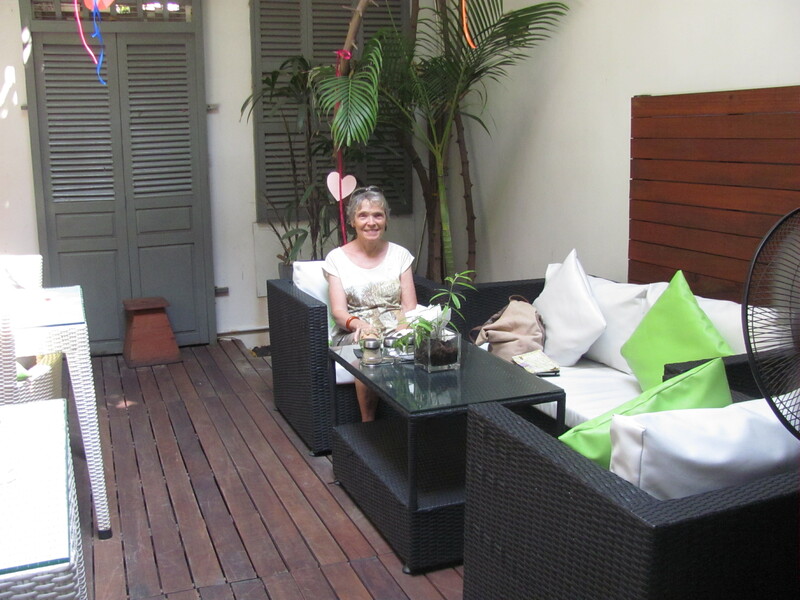 Lunch at the Tea Garden – a little hidden gem on a tiny congested street. 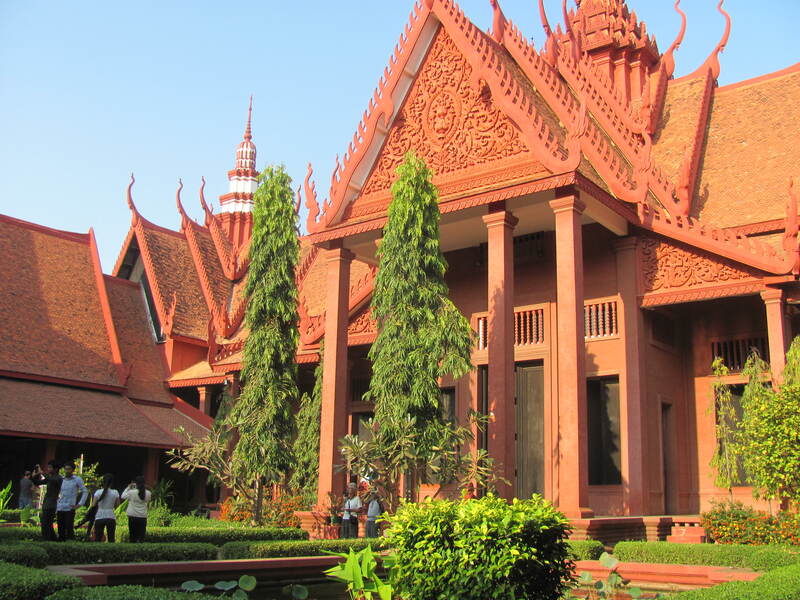 If visitors to Phnom Penh find the remembrance of the havoc brought by Pol Pot and the Khymer Rouge to this city as a bit too heavy to take in, there are other sites of more uplifting historical periods to see. 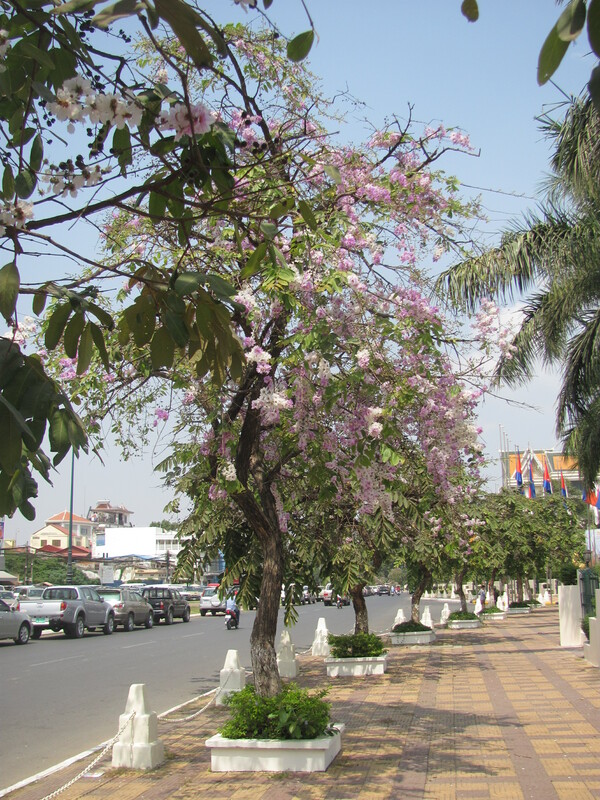 Even though this city is fairly young dating back to 1858 when it was declared the capitol of Cambodia, and thanks to their then King, Norodom, it quite quickly grew from village status to that of a glamorous city influenced by the King’s passion for anything French. The city saw a building boom of structures heavily influenced by French architecture mixed with some Khymer. 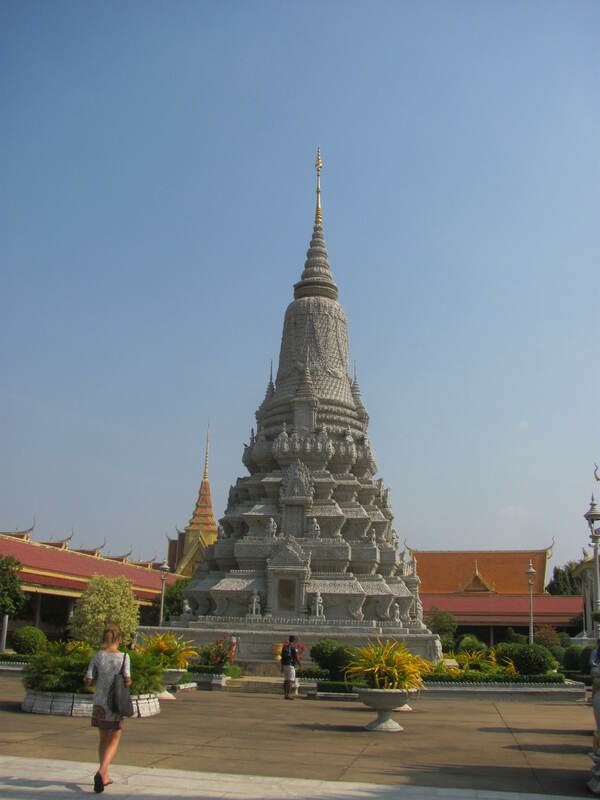 It was during his reign that the Royal Palace with its Silver Pagoda and the National Museum were built. My husband and I visited both of these attractions last year and learned much about the greatness of the Khymer civilization and the more prosperous times in the past. This year it was time to visit another talked about building with unique features dating back to the the king who succeeded Norodom – King Sihanouk- who unlike his father had a passion for all things Art Deco. 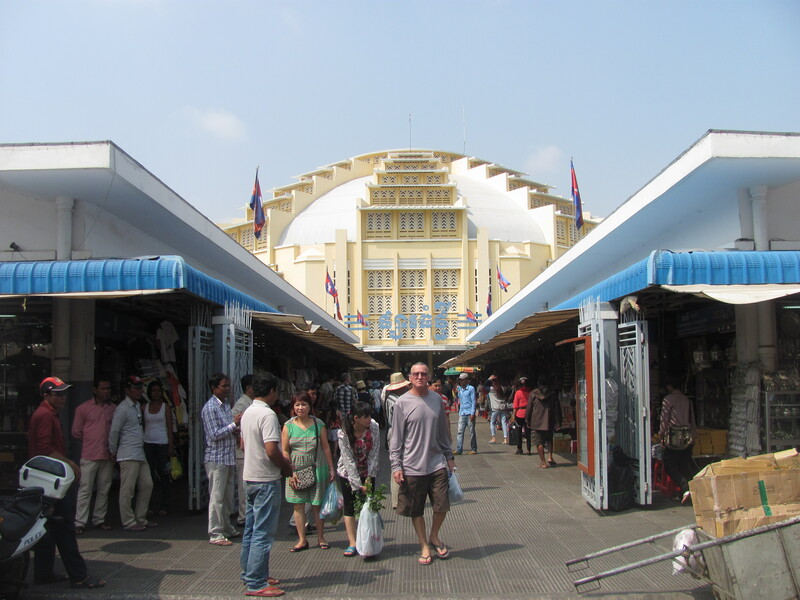 As a result, Phonm Penh has probably the most interesting building in Asia devoted to a huge market housing thousands of vendors. Goods from gold jewellery, gems of all kinds, beautiful fabrics, souvenirs, flowers and hardware can be found here. 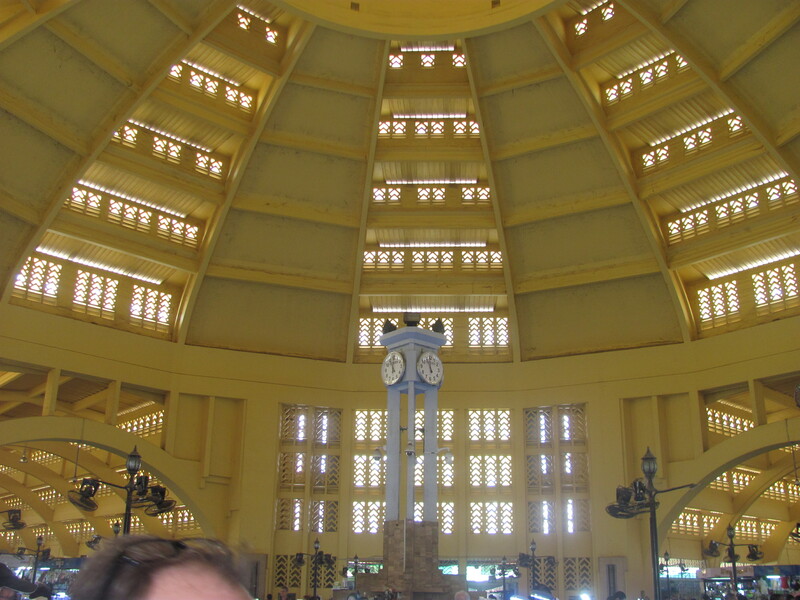 The Central Market as its commonly called or Phsar Themi in Cambodian was built 1935 in the shape of a dome with four wings jutting out from each side. Its gold painted dome is visible from all parts of the city as it sits right in the middle. Although getting there was not easy (I actually broke down and took a tuk tuk) once inside I found one of the cleanest and most well-organized markets I have ever seen. I can say this because not once did I get lost. I also did not find the vendors to be too ‘pushy’ and the prices to be fairly reasonable. I had no intention of buying anything until I ran across some very lovely silk scarves which I simply couldn’t resist. Cambodia is known for its quality silk and these certainly are good examples of that claim. Entrance to the National Museum. The Silver Pagoda on the grounds of the Royal Palace. 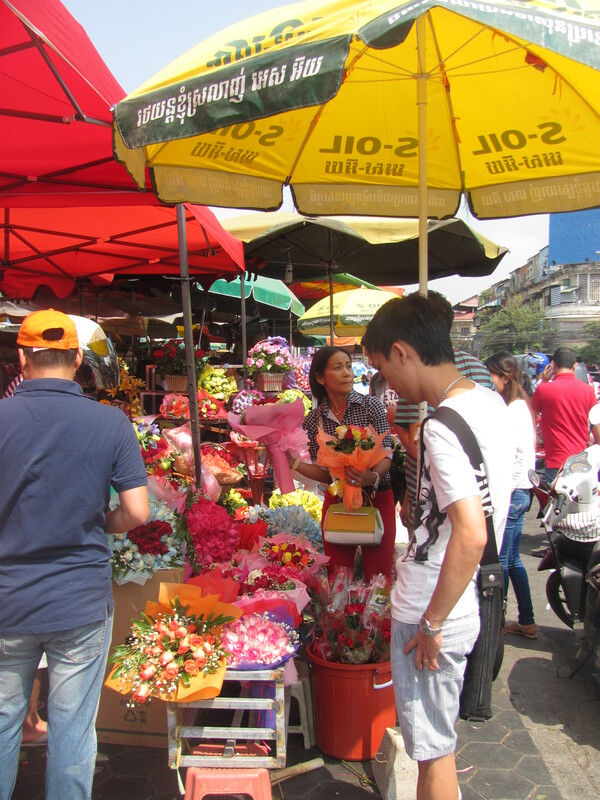 Approaching the Central Market (Phsar Themi). One of the four entrances. Doing a brisk business for Valentine’s Day. As I reflect upon my four days in Phnom Penh, I realize that it’s not an easy city to visit if you are on your own and on a budget. It does take some adjusting due to its problematic social concerns as a result of its power-hungry political leaders and just a few too many non-government agencies who do good things but take away the responsibility of the government to do more. Aside from poorly executed social services and politics, which have caused many of the present day problems facing this city, the pulse of the city which draws people like me back are the people. In spite of their past and their present, the majority of them that I have met are still smiling and they are still honest. I do not get the impression that they are out to service the influx of us tourists simply for the money. They are genuine and want to help. I hope whatever happens to them in the future doesn’t change them. One thing they have going for them which I think helps to sustain them is that they have had a peaceful country now for over 20 years. After what they went through in the Pol Pot years, it’s easier for me to understand why they can endure so much. A rare quiet street in the city.